Precision Foods Thick-It Puree is a delicious alternative for individuals who experience trouble chewing and swallowing solid foods. This puree is ideal for those who follow a dysphagia diet. This puree is available in a variety of delicious flavors that range from breakfast, lunch, snack, and dinner flavors. 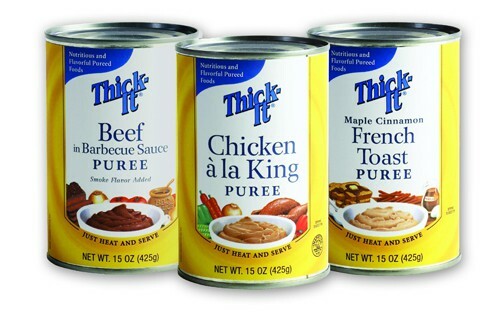 The Shelf-Stable Thick-It Pureed Foods are formulated to have a consistent texture, reliable nutrition, and ideal as a safe and satisfying meal. 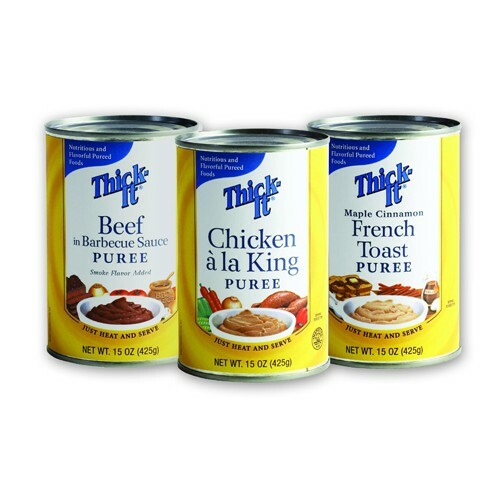 Each meal is conveniently packaged in a long-life can that is easy-to-open and ready-to-eat. This puree can be enjoyed right out of the can or can be heated when patients desire a nice warm meal. Each can of puree equals 5 servings and it can be frozen for versatility and later consumption. Because they come ready-to-eat, this puree is ideal for those who want to save time in the kitchen. This allows you to spend more time doing all the things you truly enjoy, while easily meeting your loved one's swallowing and dietary needs. You'll find a wide variety of pre-made purees, food thickeners, and liquid thickeners, on sale at Vitality Medical.